Submit an application for a UN Day grant! Deadline: 28 July 2017 by noon! Deadline for applications: 12.00 noon, Friday 28th July 2017. Since 1992, 17th October has been recognised by the United Nations as the International Day for the Eradication of Poverty. 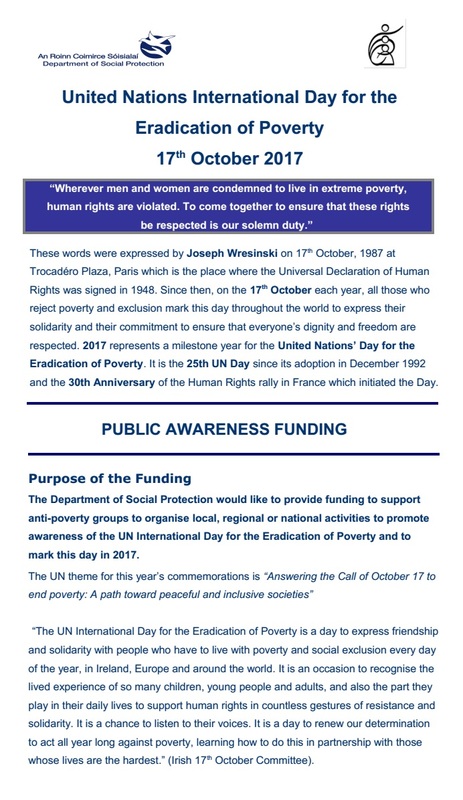 The Irish Department of Social Protection has a limited amount of funding to support anti-poverty groups to organise local, regional or national activities to promote awareness of the UN International Day for the Eradication of Poverty and to mark this day in 2017. The total amount of funding available is approximately €55,000. It is envisaged that approximately 16 – 20 projects across the country will be funded. This funding is open to anti-poverty organisations and groups working with people experiencing poverty at national or local level. The Department of Social Protection will NOT accept applications from profit making or trading companies, individuals, local and community development programme companies, local authorities or statutory bodies or any bodies outside the Republic of Ireland. to express solidarity with the fight to eradicate poverty globally. Work that has already happened. Any other project or costs outside of the scope of the guidelines set down by the Department of Social Protection for this programme. Please note that the closing date for receipt of applications is 12 noon Friday 28th July 2017. ← A tribute to Simone Veil, the woman who first read the 17 October 1987 Call to Action! Have your say about the theme of the 2019 End Poverty Day!